I normally shy away from re-posting but a couple of weeks ago I went to visit a friend a few states/provinces away. 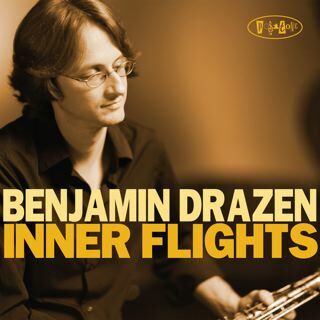 I took Benjamin Drazen's Inner Flights as one of my "driving albums". I ended up listening to the album for four days straight. In and out of the car. Inner Flights has become an infectious record for me on various technical, thoughtful and entertaining levels. It has also become a contender for top albums over the year. So I decided I really wanted to share my original thoughts on this album with some of you again. There is something warm and positive about Benjamin Drazen that keeps me coming back to Inner Flights (Posi-Tone Records). Drazen, a veteran of the New York scene has performed in various settings (funk, jazz and soul) as well as with some prestigious company (Rashied Ali, Dave Liebman, Lew Soloff and Gary Bartz to name a few). It is a surprise that Inner Flights is his first album as a leader. Pretty much growing up in the New York scene, Benjamin Drazen shows wonderful penchant for strength in performance and melody. The opener, "Mr. Twilight" is a fast paced number with real intent. Drazen bring a muscle to his musicianship that I haven't heard since early Branford Marsalis or Eric Alexander records. While the obvious compositional influences are there (Sonny Rollins, Thelonious Monk and Jackie McLean) Drazen makes his individual voice known very quickly and I think every lover of jazz will gravitate to him, no problem. The follow up "Monkish", a playful and appropriate tribute, delivers with great verve. The quartet, especially Jon Davis on piano will have you imagining Monk setting in the audience saying "This kid is pretty good" (Well, maybe Monk wouldn't say it so nicely). The title track, "Inner Flights" and "Neeney's Waltz" both add depth, intensity and intimacy to the sessions. The quartet shows a real richness and lovely craftsmanship that switches from a uptempo funky groove (in the case of "Inner Flights") to delightful romanticism ("Neeney's Waltz"). "Kickin' Up Dirt" highlights Benjamin Drazen's more soulful side. It's also an opportunity for DeRosa to standout as well, with some touching and fluid pace on the bass. The closing number is the standard, "Polka Dots And Moonbeams" which seems the perfect way to end this outing. Drazen makes it a lush, bluesy and beautiful affair. He doesn't oversimplify the passages here. He just let's the melody speak for itself but he ends up having the listen remember exactly who is performing.